Without routine maintenance, your garage door system won't live up to its full potential. We've rounded up some basic steps you can take in order to keep your garage door in perfect shape for many years. There is a whole range of issues that can arise from letting your garage door system become incredibly dirty. The panels can develop rust or ort, depending on their material, which will not only damage them aesthetically but will also hinder the door's performance. Your garage door tracks also need to be kept clean and clear off debris for the system to perform smoothly. A buildup of dirt within each track section can lead to blockage or misalignment. Your safety sensors can also suffer. Their lenses can become dirty, which will result in them failing to properly detect an obstacle in the door's path, or will make them falsely detect one, which will make your door start malfunctioning inexplicable as if it's become possessed. You can prevent a lot of issues by simply keeping the system's components clean. Track repair and realignment will be required if you allow dents and minor track damage to develop. If the door keeps catching, its alignment can be thrown off eventually. By regularly inspecting the condition of your tracks you'll be able to tell when they need to be repaired before their condition worsens. Springs can also benefit from this procedure. A broken spring can be very dangerous, which is why catching things early before it snaps is important. Look for rust patches, slack tension and other evidence of damage, as they can be signs that professional spring replacement is due. Both your springs and your rollers will require this if your door is struggling with friction while opening and closing. Roller joints rollers can be lubricated, but be careful not to spill excessive amounts on the surface of the rollers themselves. You must be cautious with the type of lubrication you use. Some products will not be suitable as they'll be sensitive to changing temperatures and can result in an accumulation of dirt. You should always ensure you use a lubricant that is designed for outdoor machinery. Consult your owner's manual to be sure. The vibrations created throughout your garage door system day to day will inevitably cause its bolts and hinges to slowly untighten. You can occasionally check to see if any bolts or hinges have become too loose. Tighten them to ensure the system runs as efficiently as possible, and that no part suddenly falls off. The condition of your cables is also incredibly important. If they are rusty or frayed, they can break, which will be very dangerous to anyone nearby. They can also come off their drums and will have to be fitted back on securely. Only an expert should ever handle repairing your garage door cables or replacing them. The door's perfect balance is a sign of the springs and other mechanical components working correctly. Switch to manual operation and then open your door halfway. If the panels stay in place and don't lower or rise, the door is perfectly balanced. If it does move either towards closing or opening, the springs may need an adjustment or a replacement. 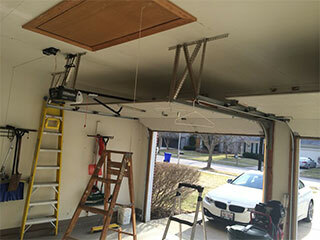 Call our experts at Garage Door Repair Chicago if you need professional assistance of any kind.